It is hard to find another subject about which so many words had been written . Valves are beautiful and there is something about their organic simplicity that makes people concerned. Behind the technical background of course, technical specification, sonic signature, data sheets and personal preference, there’ s more than just appearance. The following information I have gathered while shopping around after I got bitten by the glowy amp bug. As I shopped I started gathering all kinds of information about electron tubes and was left with a lot more questions. All of this information is researched, as opposed to personal experience, and I thought it would be fun to put it up for discussion The most popular current production electron tubes generally focus on supplying new tube based products with a constant supply of tubes, providing an alternative to the rising prices of NOS tubes and supply to the Chinese & Russian domestic market. Tubes used in new instrument amps (particularly guitar and bass amps): The 6L6GC, 6V6GT, EL84 power tubes & 12AT7, 12AX7 preamp tubes are particularly favoured for this application. The EL34, 6550, KT66, KT77, 12AU7, 12AY7, 5AR4, 5U4G, 5Y3S tubes are also occasionally used usually in premium models. Tubes used for new hifi amps, preamps and buffers: The most popularly used tubes for hifi include the 2A3 & 300B triodes, KT66 & KT88 beam tetrodes, EL34 & EL84 pentodes, 5AR4, 5U4G & 274B rectifiers, as well as the 211, 805 & 845 transmitting triodes for power amplification; and the 12AT7, 12AU7, 12AX7, 6DJ8, 6SL7 & 6SN7 for buffers, drivers and pre amplification. 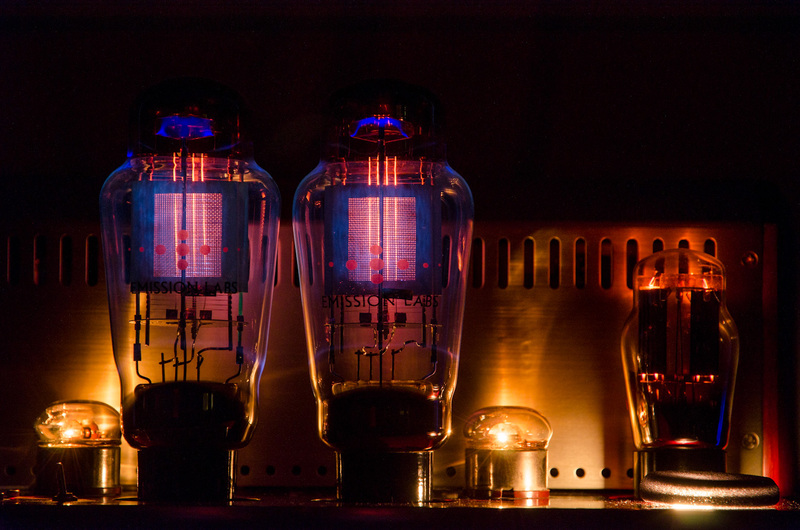 However, just about any suitable glass electron tube has been used in hifi at some point of time; less often used, but well regarded tubes include the 12BH7, 101D, 205D, 274B, 350B, 5881, 807, PX-4 & PX-25; and the Chinese/Soviet 6C33C-Б, 6H30Π, 6N1/6Н1П, 6N2/6Н2П, 6P3P/6Π3C, 6P6P/6Π6C, FU-50/ГУ-50 & ГМ-70. Tubes used for new studio gear: The 12AT7 & 12AX7 are currently the most used in tube studio preamps, mixers, buffers and processors. Smaller studios tend to use active speakers and power amplifiers are less common and generally use hifi or prosumer amps. NOS replacements: NOS tubes, especially the tubes made in the 50s & 60s (the golden age of the electron tube) are particularly prized, in particular American and West European made tubes as well as some Australian and Japanese ones. 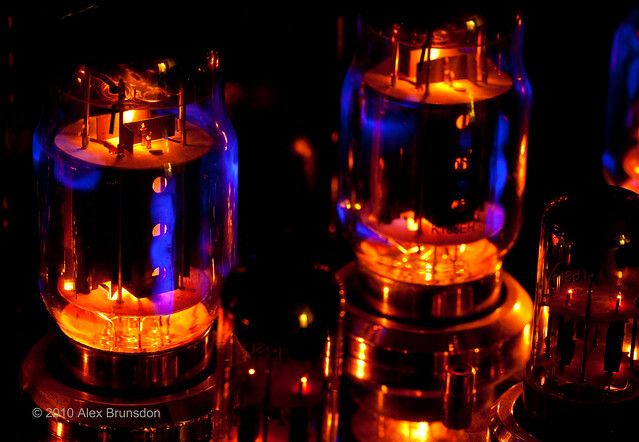 All electron tubes, especially power and transmitting tubes in vintage radios, guitar amps, hifi amps all need to be replaced regularly and in many cases popular NOS tubes have inflated to extremely high prices. NOS prices for the best 274A, 274B, 300B, 350B, KT88, 6DJ8 & 12AX7 are pretty insane these days and EL34, EL84, KT66, KT77, 2A3, 211, 5AR4, 5U4G, 6SL7, 6SN7, 12AT7, 12AU7, 572B, 805, 845, 6146B & 50CA10 prices are rising due to scarcity. Chinese & Russian domestic market: While I’m not too sure about the Russians, the Chinese have a huge cottage industry in cheap and cheerful tube hifi, much of which is produced for the domestic market (ie. 220 Volt mains, domestic distribution only, no international warranty, only Chinese manuals or datasheets, etc). Tubes commonly used in these amps are the Chinese 5Z2P, 5Z3P, 6E2, 6F1, 6J1, 6J4, 6N1, 6N2, 6N3, 6N4, 6P1, 6N7P, 6N8P, 6N9P, 6P3P, 6P6P, 6P14, FU-7, FU-50 and their Soviet equivalents (NOS Soviet tubes can be cheaper than Chinese in some cases), as well as cheap western tubes made in China such as the EL34. Established Chinese tube gear manufacturers will occasionally use these too. The following list is a model count of the most popularly made current manufactured tubes (only counting tubes made by manufacturers and outsources, but not re badgers). The brand owner maintains the plant or factory where the tubes are made and also owns or has production & marketing rights to the design of the manufactured the tubes. The brand owner also owns the design, and contacts a manufacturer to manufacture the tubes at their plant. Some parts may or may not be made by brand owner, but the final assembly of the tubes is always done by the manufacturer. Distribution and marketing is left solely to the brand owner. The manufacturer may or may not be allowed to sell tubes with this design under their own brand. The brand owner simply sticks their brand on to tubes they distribute or sell. This type of brand is usually a manufacturer who uses electron tubes as a part, such as a hifi or guitar manufacturer, or a tube re-seller who buys tubes from several brands, badges tubes they recommend. Current production manufacturers of glass electron tubes. This is a list of manufacturers who currently make AC rectifying, receiving, voltage amplifying, low frequency amplifying, glass transmitting electron tubes (ie the tubes normally used in hifi). This is not a list of brands but a list of manufacturers. These three companies make and sell the most current production tubes currently. Numerous amp makers, both guitar and hifi, offer their tubes as stock and many re-badgers pick their recommended tubes from almost exclusively from their tubes. New Sensor Corp began with Mike Matthew’s Electro-Harmonix which made some of the best known guitar effects pedals in the 70s and 90s. In the 90s they first began selling Sovtek-branded tubes and they currently manufacture tubes in the Xpo-pul (former Reflektor) factory in Saratov, Russia, under the Electro-Harmonix & Sovtek brands (the Sovtek range still has some rebadged NOS tubes made by other factories). They also manufactured are the Genalex, Mullard and Tung-Sol reissues in the same facilities. Svetlana are current production tubes made by other Russian factories and distributed through New Sensor distribution channels. This used to include tubes from the original St. Petersburg/Leningrad Svetlana factory although they have since gone their separate ways. The number of brands and their various price points can make New Sensor tubes a bit confusing. The various New Sensor branded tubes are generally priced fairly higher than Shuguang’s and JJ’s and have a better reputation for consistent quality and reliability from audiophiles and manufacturers. Their sonic signature is described as balanced with good detail and slightly dark and they are the stock tubes of choice for many guitar amp makers and hifi amps with audiophile/high-end aspirations. Shuguang is one of the older tube manufacturers and originated as the 770 Chinese state-owned factory in Changsha, China in founded in 1958. They manufacture most of the Chinese exported tubes, either under their own brand or rebadged by others (it seems if you place a large enough order, they will happily silk screen whatever you want on the tube). They also produce tubes for the Chinese domestic market. Shuguang produces both very cheap tubes (I believe they make cheapest current productions), but also some very premium tubes so it is difficult to generalize their tubes. Their cheaper tubes have a reputation for poor consistent quality which seems to have been improving with recent years. Their premium tubes are among the priciest Chinese tubes and have been well received by the audiophile/high-end community. Shuguang’s sonic signature has been associated with being lushness and warmth with increasing detail in more premium models and well regarded by amp manufacturers and tube rebadgers looking to impart a slightly vintage signature in their products. Specifically, their rectifiers and power tubes are generally well liked, while their 12A-something-7 series do not receive a much favor. In 1994 Jan Jorgo purchased the audio tube production machinery from TESLA and set up a JJ Electronics in Čadca, Slovakia. The smallest and newest of the “Big Three”, JJ has a much smaller catalog of tubes compared to New Sensor and Shuguang and focus heavily on but has a complete range of all the most popular guitar and hifi power, preamp and rectifier tubes. JJ however produces no transmitting tubes of any kind. Aside from a few premium tubes, most of JJ’s tubes are fairly cheap and comparable or slightly higher compared to Shuguang’s prices in many regions. Like the cheap Chinese tubes, JJ has been constantly plagued with a history of poor quality consistency, and worse, poor reliability consistency – to a point where some guitar amp manufacturers specifically state that using JJ tubes will void warranty (in particular, their octal based tubes, both rectifiers and beam power tubes, seem to have a very bad reputation). Despite this reputation, JJ tubes are extremely popular with both guitar amp and hifi amp tube rollers due to their sonic signature which which is often described as dynamic and extended, and many rebadge distributors pick the best JJ tubes to resell under their own brand. These manufacturers primarily or solely manufacture tubes for hifi use generally favoring triodes to other types of tubes. These manufacturers do not make budget tubes and their prices range from premium priced to very high priced. Tianjin Electron is one of the newest Chinese Electron Tube factories. It began in the 90s after a joint venture between a Taiwanese company and Liu Zhesheng, former chief engineer of the Beijing Electron Tube Factory fell through and the Taiwanese partner withdrew. Setting up a new plant in Tainjin under the new Fullmusic brand, they started production on Western Electric tubes, later adding popular non-WE tubes to their catalog. Like Shuguang, Tianjin will rebrand tubes for their bulk clients and are available as stock tubes on a good number of high-end hifi manufacturers and as rebrands from many distributors and resellers who focus on the hifi market segment. Their sonic signature is much like the premium and high-end Shuguang tubes, being described as lush and warm with good detail. The story of Emission Labs begins in 1998 after Anton Schönfeld left AVVT when it left Prague for Roznov pod Radhostem, and was compensated with some production machinery. In 2000, he began working with Jac van de Walle of JAC-music Mülheim as distributor for his tubes, and in 2001 helped developed high power triodes for Ayon Audio. In 2002, Anton Schönfeld & Jac van de Walle decided to create a brand for Anton’s tubes and Emission Labs was born. Emission Labs are pricey, compared to Chinese high end competitors, but more affordable than their Czech competitors. 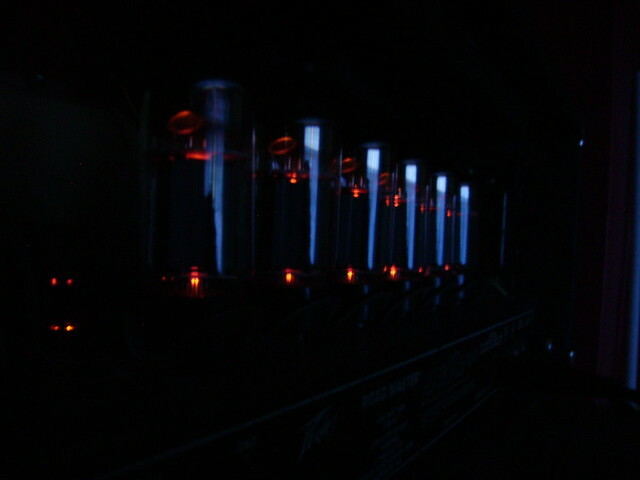 Emission Labs tubes like other European tubes have a sonic signature described as extended, linear and dynamic, and are well favored by audiophiles. Psavane began as a brand set up by various investors to further develop advanced hifi tubes the based on the Shuguang’s 50th anniversary Treasure series tubes. The T-series Psvane branded tubes were initially produced in 2010 by Shuguang. However by 2011, this arrangement was not working for all parties involved and Psvane split ties with Shuguang. After acquiring the Foshan Guiguang (桂光) (which in turn was using machinery from the Liuzhou Electron Tube Factory (柳州市电子管厂)), Psvane continued production of its original series and added an updated version of their T-series, a more budget friendly series and a Western Electric replica series to their catalog. The original T-series tubes were well regarded among audiophile who liked Shuguang’s Treasure series and is considered a refinement of the design. These manufacturers only produce a very small range of glass electron tubes or have very small production quantities, or both. Most of the tubes made by these manufacturers are very well made and command very high prices due to scarcity and desirability. Svetlana JSC in St. Petersburg is one of the oldest companies that currently makes audio tubes. Я. М. Айваз was founded in 1889 by Yankev Ayvaz, and first used the “Svetlana” brand for their light bulbs in 1914 and by 1929 also became associated with the factory and the electron tubes they produced. During the Soviet era, Svetlana was a research and development center, many tubes were initially developed in Svetlana before production was moved to other factories for logistical reasons. In the post Soviet era, Svetlana entered a lengthy period of co-operation with New Sensor but have now messily broken up the relationship. In the wake of the break up they currently only produce 4 audio tubes while restructuring their distribution network. Based Prague, KR Audio was founded in 1992 by Ricardo and Eunice Kron and began making tubes in 1994. While KR Audio has a product range that can comes close to rivaling the Hifi Specialists, they simply are unable to keep production up with demand due to their handmade production method, and are rarely available outside of KR audio amps as stock tubes, which are designed to bring out the best in these tubes. Sonic signature is similar to other Czech and JJ tubes being described as extended and dynamic. Jozefina Krahulcova initially began distributing EAT branded tubes produced by Anton Schönfeld & Tesla Vršovice in 2002(3?). In 2006, EAT became a full manufacturer after purchasing the tube production facilities in Prague from Tesla Vršovice. Sonic signature of EAT tubes have been described as uncoloured, extended and dynamic, these very high priced tubes is strongly recommended by audiophiles with deep pockets. Elrog is a industrial tube manufacturer based in Lübtheen run by Klaus Schaffernich. At request of Thomas Deyerling and Stefan Noll Cayin Audio Distribution GMBH, Klaus Schaffernicht designed and manufactured a modern update of the 845 tube which was released in 2012. In 2001 Gerhard Hirt consolidated his Italian Viac amplifier brand and newly acquired Prague based vacuum tube facilities from AVVT to form Ayon Audio, based in Gratkorn. Anton Schönfeld from the Czech Republic helped develop Ayon’s high power tubes, and these are still being produced in Prague to this day. Production quantities are very low and the AA-62B is exclusively available as stock or upgrade tubes on Ayon amplifiers. Founded 1957 Kyoto, Takatsuki Denki is an electronics company, located appropriately enough in Takatsuki, specializing in lighting and assitive technology. In 2010, they began production of 300B tubes which were distributed by Air Tight. The price of these tubes are possibly the highest of any current production tube. The sonic signature of their 300B described as uncoloured, extended and dynamic and while not without shortcomings, is considered one of the most excellent tube overall by most audiophiles. Westrex produces Western Electric 300B reissues and seems to have plans for other WE tubes. Westrex is currently moving or are doing some sort of reshuffling and is currently not producing tubes; production is promised to restart in 2013. Golden Dragon tubes are outsourced or rebadged from Shuguang, SED and formerly from EI. Unsure about their transmitting tubes. PM Tubes are rebadged Shuguang & SED tubes picked for guitar amps. Formerly O&J Enterprise, Jadson and Ouyang (the “J” & “O” respectively in O&J Enterprise) are (were?) both engineers that worked in the Shuguang Factory in Changsha for quite a few years before starting production Valve Art in Shuguang’s Changsha factory. Sonically their tubes have been described as bright and detailed with good bass punch. Valve Art tubes are relatively cheap but well constructed and are considered good value for money. Liu Ningsheng’s Create Audio tubes are manufactured by Shuguang and distributed out of Hong Kong. The gold or luxury series was their inital series launched around 2009(? ), and they have recently created the silver and standard series 12AT7, 12AU7 & 12AX7 targeting lower price points. The gold series at least seeks to emulate the European sonic signature and does it very well at a lower price. Hanshare Electronics is an Ebay Store that is currently promoting the “Canada Fuller” brand. “Ricky Xia” is the only name I can find associated with Hanshare. The only brick and motar store I can find that carries this brand is HAN Trade, a tube distributor based in Beijing and London. Not much info except some seller claims that the internals are sourced from Canada and UK and the tubes are assembled in the Shuguang plant. There is a bit of a rave about their KT88s on various forums but not much feedback. Meixing commissioned a batch of unusual looking tubes from Shuguang and Guiguang (I believe in 2011). Used in many of their 2011 and later amplifiers. The only description I have found of these tubes is that they sound very dark. UX AND CX DESIGNATIONS OF THE 1920’S AND 1930’S TUBES.